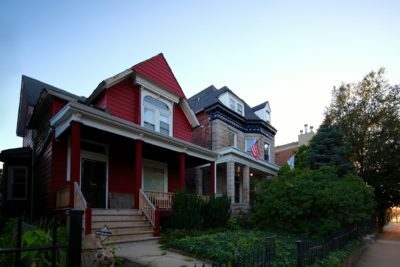 A few times a year we send out Neighborhood Notebook, our newsletter covering architecture, preservation, and hidden history. 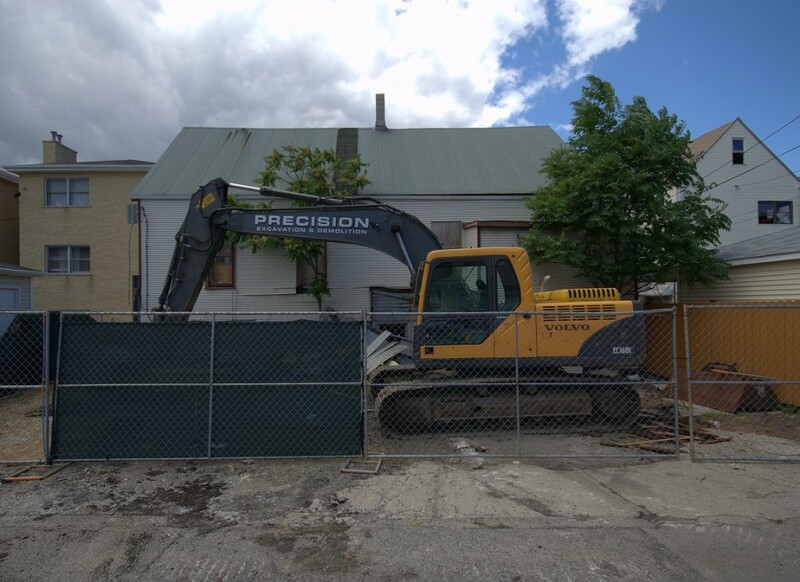 After some time on the city’s Demolition Delay Hold List, the review period has ended and demolition will be proceeding for the “orange-rated” house at 2821 North Avers Avenue. I recently visited one late afternoon to check on the site, and photograph the current state of the structure. 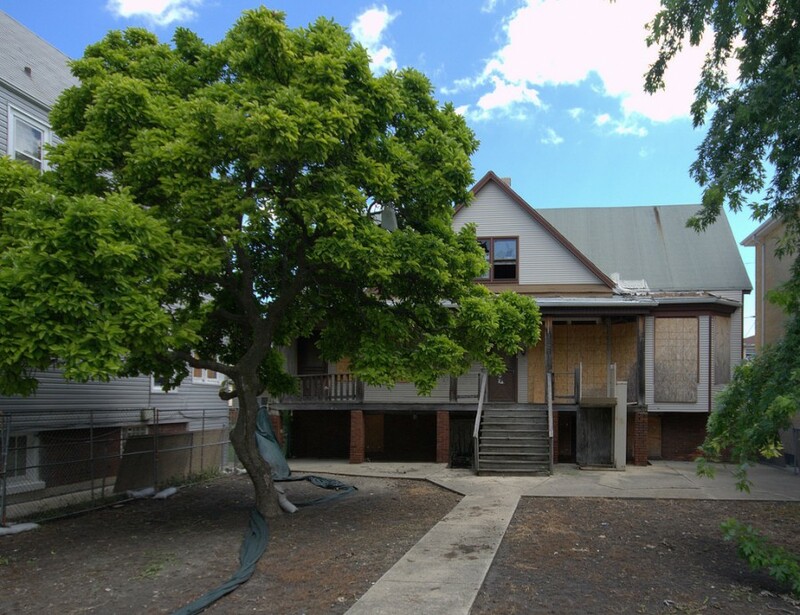 Looking into available public records, conflicting information exists regarding the actual age of this building: by all real estate-related and Cook County Assessor’s Office information that can be obtained, this house was built in 1908. However, the City of Chicago’s Historic Resources Survey–a ground-level, detailed effort completed nearly 20 years ago–also indicates this as a significant, “orange-rated” structure, circa 1880s. A review of the appearance of the building and its situation and surrounding site seems to suggest a pre-1900 existence: the double-sized, wide lot with an especially large front yard alludes to a possible original purpose as as family’s farmhouse when this area was mostly undeveloped farmland on the outskirts of early Logan Square. The construction style of the building also appears in line with examples of 1860s-1880s modest “Carpenter’s Gothic” rural housing: simple construction with a steeply-pitched roof line and broad gables spanning the front and both sides of the house. This detail below from the 1896 Sanborn Fire Insurance Map of Chicago illustrates the 2800 block of North Avers Avenue. The structure at 2821 North Avers Avenue does not appear however on its current site. 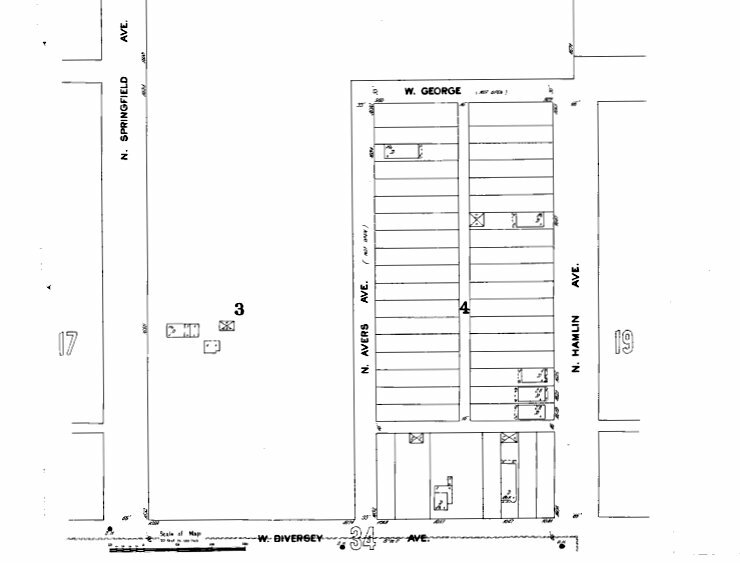 Detail of 1896 Sanborn Fire Insurance Map depicting 2800 block of Avers Avenue and undeveloped lots. From searching the City of Chicago’s Historic Resources Survey online database, you find an entry for the 2821 North Avers Avenue structure (addressed as “2821-2823”), with a built date in the 1880s. Within the Historic Resources Survey, color coding was used to assign structures “historic significance” or importance: “orange” (the second-highest coding) signifies a structure that “possesses potentially significant architectural or historical features.” The print version of the survey however, as seen below, indicates a date of 1906. 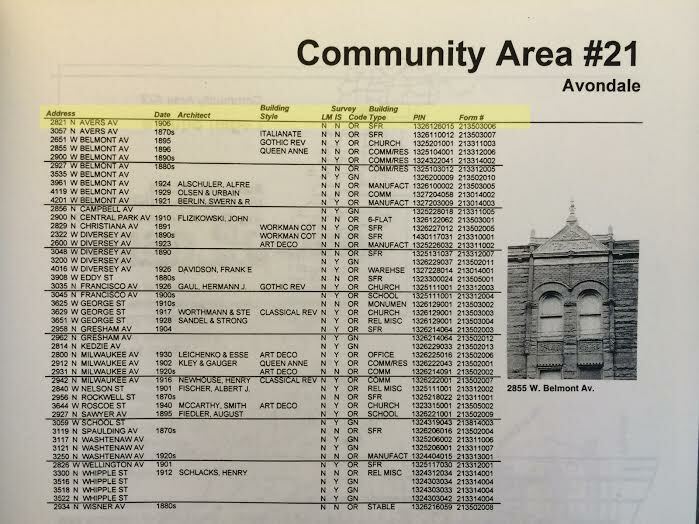 Detail from print version of Chicago Historic Resources Survey, 2821 North Avers Avenue record highlighted at top. Other records like real estate listings indicate this property had been in a state of foreclosure and on the market for some time. 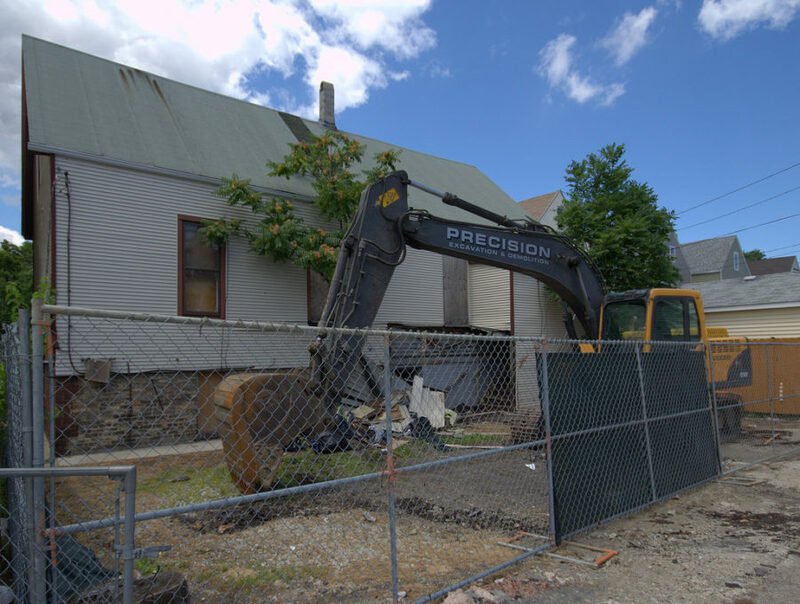 After finally being purchased by a brokerage company (Chexapad, LLC), there was a request through city zoning records for an addition to be built on the rear in 2011, but this never took place, and the property has languished since. Western view, rear of 2821 North Avers Avenue house under demolition. 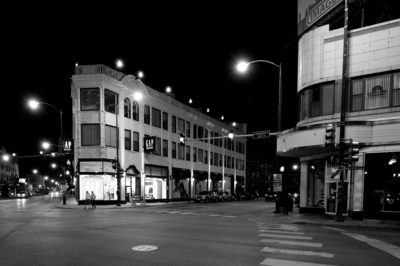 As these photographs illustrate, demolition equipment is in place, and the days for this “significant” artifact of early Logan Square history are numbered–for it to be lost like so many others recently.